Abstract: It is explained in detail, using a numerical laser model, while the input--output curve of quasi-three-level lasers can be pronouncedly nonlinear. Effectively, one a the slope efficiency which rises for increasing pump power. Today, I have a topic in laser physics. According to simple laser models, one would expect that the output power of a laser depends linearly on the pump power above the threshold pump power. Long ago, I published a Spotlight article where I presented various reasons why that dependence can actually be nonlinear under various circumstances. One of the explained reasons was related to quasi-three-level lasers where the transverse shape of the excitation profile of the laser ions depends on the power level. Today, I want to come back to this issue and give some more details. At any power level above threshold, the laser gain per round trip must exactly equal the resonator losses per round trip once we are in the steady state. So the laser gain must be clamped to a constant value above threshold. 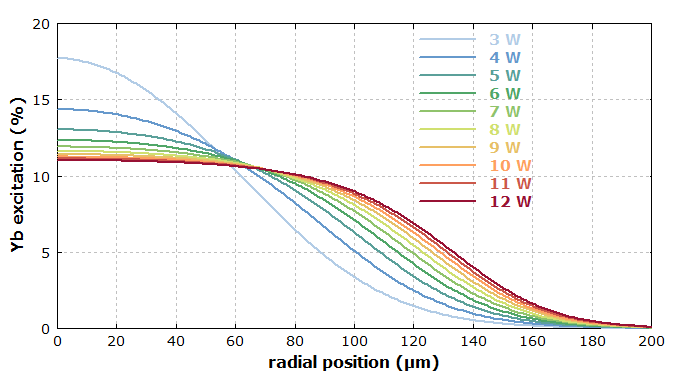 When ignoring the transverse dependencies (or simply assuming transverse top-hat intensity profiles for signal and pump) as well as temperature changes, there is a fixed relation between the laser gain and the average excitation of laser ions. For constant gain, we thus must have a constant number of excited laser ions. That means that the power lost by fluorescence is also constant. Therefore, an increased pump power can only be converted into increased laser output power, not into additional fluorescence. Some constant fraction of additional pump power is lost through incomplete pump absorption, the quantum defect and due to parasitic intracavity losses, but the fractions of those power losses are usually all constant. Therefore, each additional milliwatt of pump power adds the same amount to the laser output power. What changes if we have Gaussian shapes of the pump and laser beam, for example, is that we don't have a fixed relation between gain and excitation of laser ions any more. 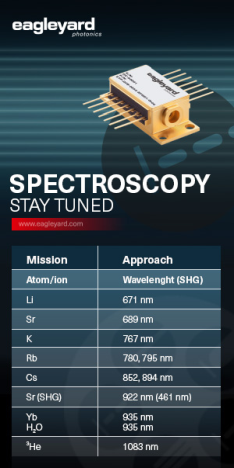 This is because ions near the beam axis, “seeing” the maximum laser intensity, contribute more effectively to the laser gain than ions further away from the axis, and the shape of the transverse excitation pattern can change with the power level. For studying that in a realistic case, I have set up a simple continuous-wave bulk laser model, using the software RP Fiber Power. (Although that has been designed for fiber lasers, it works as well for bulk lasers as long as we can assume constant shapes of the transverse intensity patterns, which is very often the case.) Here, I have assumed Gaussian beams with 100 um beam radius for both pump and laser radiation and an output coupler mirror with 80% reflectivity. Pump and signal wavelengths are 940 nm and 1030 nm, respectively. 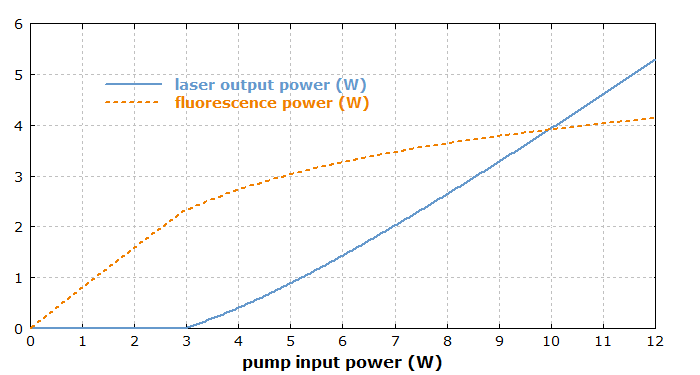 Figure 1: Laser output power and fluorescence power of a 1030-nm Yb:YAG laser as functions of the input pump power. We see the pronouncedly nonlinear input–output characteristics. Also, the fluorescence power rises substantially when going further above the threshold pump power. Figure 2: Degree of Yb3+ excitation (averaged in z direction) for various pump powers. At the laser threshold (3 W pump power), the excitation has roughly got the shape of the pump intensity profile (actually a bit broader due to saturation preferentially on the beam axis). For higher pump powers, the excitation profile gets substantially broader, but finally approaches an asymptotic shape. Therefore, the gain efficiency drops substantially above the laser threshold but then approaches its asymptotic value. A consequence of that is that the total Yb excitation and thus also the fluorescence power first rises quickly but later on less quickly. That is consistent with the initially smaller slope efficiency, which then rises. 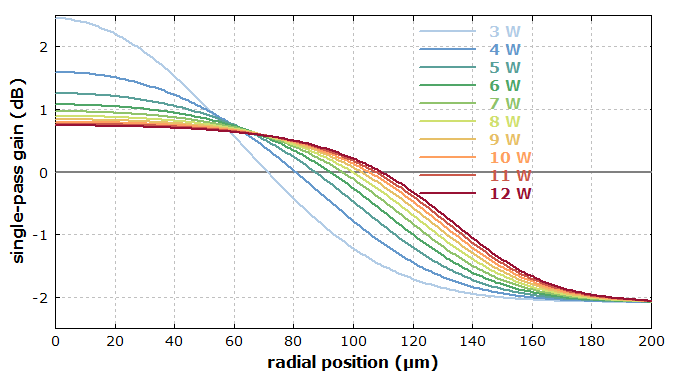 Figure 3: Transverse distribution of the single-pass laser gain for various pump powers. One can see that at threshold the gain is high on the beam axis but substantially negative for radial positions beyond 70 um, because there we have reabsorption of unexcited ytterbium. For higher pump powers, the increasing pump and laser intensity in that region further increase the excitation, whereas the excitation in the center region is reduced by saturation, since the overall gain must stay constant. For a 4-level gain medium, where that reabsorption effect does not occur, there is only a weak broadening of the excitation pattern for higher powers. Therefore, there is only a weak nonlinearity of the input–output curve. One can also test these are things in situations where the pump and signal beam radii are different. Qualitatively, quite similar things happen there.